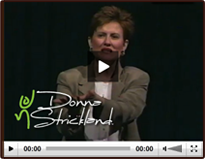 Learn how to facilitate transitions…constant rapidly changing transitions. Know the difference between change and transition, know the 3 phases of transition. Know specific intervention skills for each phase. The primary leadership task for the 21st Century is harnessing the human spirit to help customers. In a time of paradigm change, this involves facilitation of transitions, letting go of the past, and becoming comfortable with your own personal transitions. Get it that you and your employees are all “temps.” You will need to find new ways to glue your team together rather than with promises of retirement and gold watches. Know that employees tend to be more productive and committed when they are choosing to stay in an organization because of the work and because of the customers. Organizational leaders play a key role in helping individuals and organizations break free from the old reality. While nearly all surviving employees experience feelings of violation and manifest symptoms of layoff survivor sickness, there are individual variations in symptom type and recovery prognosis. Learn about these individual differences. There are 4 basic types: The Learners, The Overwhelmed, The BS’ers and The Entrenched (“Breaking Free,” David Noer, 1997). Know how to identify these individuals and how to intervene appropriately. Develop Learners in your organization. Know which ones are not learners, and know how to help them get unstuck. The learning response frees people to invest their energy in psychically nurturing work that facilitates increased organizational productivity. Learners are those who can learn from experience and have the skill of letting go of the old and venturing into an ambiguous future armed with nothing more than self-esteem and a positive attitude. Any organization has 5-20% Learners. Find them. Get to know yourself better. Your intrapersonal insight is worth its weight in gold. Know your own rhythms, reactions, realities. Invest in good leadership training for yourself. Complete a 360-degree feedback instrument. Get information from the ones you lead about what kind of leader you really are. Do you see yourself as others see you? Develop a sense of humor and a spiritual practice that both nourish you and remind you that your life and work have meaning. Discover or re-discover your connectedness to the meaning of your life and work. To sum it all up, 21st Century Leadership skills are about self awareness, clarity of own needs and agenda, obtaining valid data on how others perceive you, being able to listen well, having the ability to give and receive feedback in a timely fashion, having incredible coaching and counseling skills, operating from a model and theory of transition, having the ability to stimulate collective dialogue on your team, all while keeping front and center your sense of humor and your faith.